The drawer fits within an opening at the top of the pigeonholes. 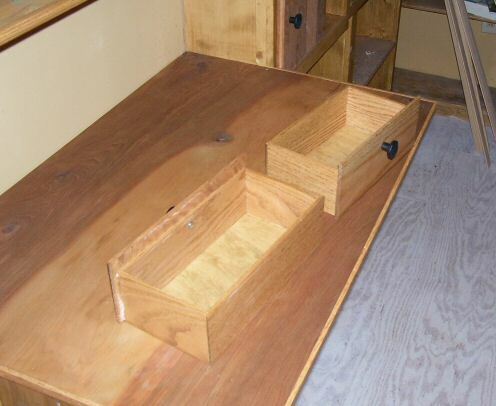 I used 1/4″ oak inside the opening as guides for the drawer. The front of the drawer fits flush with the front of the desk assembly. Everything is stained a golden oak color. 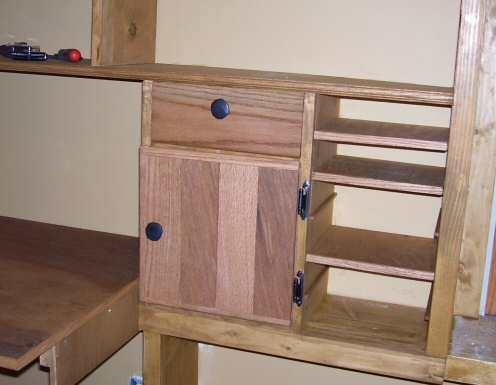 The drawers are made of 1/4″ oak on all the sides, and 5/32″ basswood on the bottom. The joints are all rabbeted and glued for added strength, and the front is another 1/4″ piece of oak to fit the opening. The handles are made of beaten iron. Here’s the entire desk with the doors installed and everything stained. 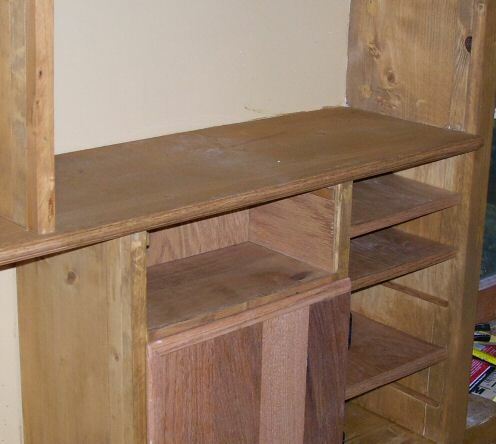 The adjustable shelves and drawers are also in place and stained. Behind the doors are pigeonholes for folders and other papers. 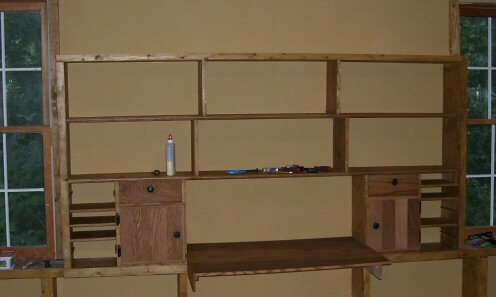 The desk surface is edged with 1/4″ oak and stained the same as the shelves and doors. This is the completed door covering the pigeonholes, and a small drawer above them. The door is made of 1/2″ plywood with 1/4″ oak on the surface, and 3/4″ oak trim molding around the edges. The drawer is made of 1/4″ oak for the front and sides, and 5/32″ basswood for the bottom. The handles are beaten iron I found in a hardware store.